Haakaa’s standard neck stainless steel thermal baby bottle keeps liquids hot or cold for 6 hours. And you can choose to purchase a straw-top lid or silicone sealing cap separately or down the road to extend the life and functionality of your Haaka bottle by turning it into a children’s straw-top bottle and/or a food and general storage jar. Care: To ensure vacuum insulated system works properly, do not boil bottle. Check bottle and teat condition regularly, replace with new teat if product shows any damage. Dishwasher safe. Or hand wash bottle with warm soapy water and rinse thoroughly. 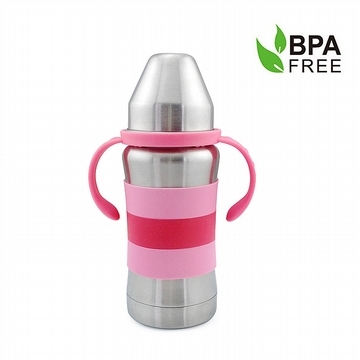 Thermal bottle can be sterilized by rinsing with boiling water. Air dry after each clean. Store in clean dry place.